The stylish and happening 2nd Floor Events only opened in 2013, and has quickly become one of Toronto’s most popular event venues located above popular ping-pong venue SPIN at King West. Just last year, we were at 2nd Floor for several occasions, including The Tastemakers book launch, the inaugural Taste of Toronto preview, and the Open Wines Party. Now, 2nd Floor Events is taking it up to another level, with the launch of their own in-house catering service. Chef Jeff Dueck, having worked as executive chef at Oliver & Bonacini’s Canoe, the illustrious Bistro 990, and many other top restaurants in Toronto, heads the culinary team bringing with him over 30 years of experience. Chef Dueck crafts a menu where items can be served in a variety of ways – as a canapé, a starter, a plated meal, or at a food station. This allows the food to be tailored to different styles of events, ranging from a stand-up reception to a seated dinner and everything in between. Ingredients are sourced locally, ensuring freshness and quality, and supporting Ontario farmers, artisans, and food purveyors. The night began with some wine and canapés. From the garden menu, we sampled the ratatouille in a corn bread cup, the savoury tarte tatin, and the baked mini potato. From the sea menu, we were served the candied salmon. Of these, our favourite was definitely the tarte tatin, with its sweet caramelized Cipollini onion in a delicate crust. Note, these canapés can also be served as stationed tapas, if so desired. After the canapés the room dividers lifted, revealing a long farmhouse table and signalling for the guests to take their seats as dinner was about to begin. Suddenly the venue was transformed from a casual reception-style space to a more intimate dining setting, showing how easily the space can be adapted to suit the event being hosted. For dinner, there were five courses, the first of which was an arugula salad with duck prosciutto. The sweetness of the walnuts and the apple cider dressing, contrasted beautifully with the saltiness of the prosciutto and the bitter notes of the arugula. Next, we had the pan seared sea scallop, and line-caught pickerel. Though the pickerel was good, our choice between the two would definitely be the scallop, which was tender and perfectly cooked. The carrot puree accompaniment was also delicious. A lighter course followed with the frisee and baby kale salad. This was served family style, meant for sharing and to encourage conversation with your party. The main course was a pistachio mint encrusted Ontario lamb rack. Lamb is my favourite protein, and this did not disappoint. Mint and lamb are a classic pairing, and the pistachio and the saffron jus gave the dish even more refinement. Finally, there were the desserts, which consisted of a chocolate pot au crème and assorted cookies. The pot au crème was soft and velvety, and the dark chocolate and strawberry sauces complemented nicely. During our time at 2nd Floor Events, versatility was definitely on showcase. You have lots of choices from sea, farm, and garden from the new in-house catering service. For the drink service, you have different ways to structure your bar, whether it’s cash, tickets, tab, or open bar. And the space itself can transform depending on the style of the event being held. 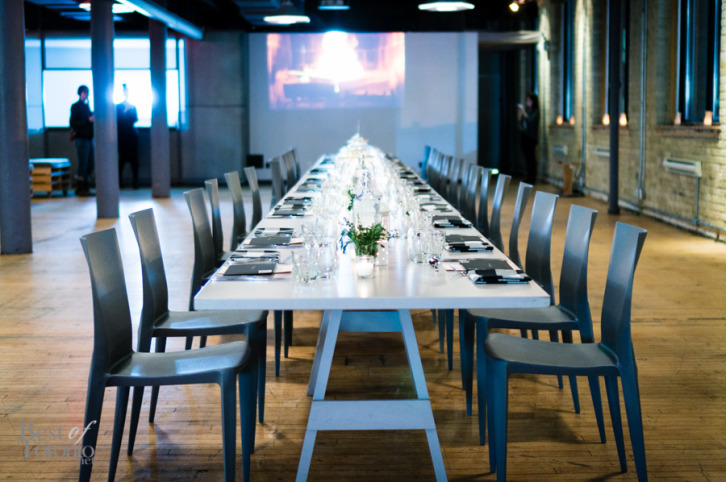 With all of this flexibility available, 2nd Floor Events can accommodate just about any type of social gathering, whether large or small, casual or formal, open or intimate. Check out 2nd Floor Events for your event needs – it’s located at 461 King St. West, just west of Spadina Ave.